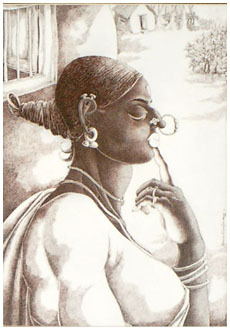 Bairu Raghuram was born in Hyderabad in 1949. He completed his Bachelor of Arts from Osmania University and then continued to finish his Diploma in Drawing and Painting from I.F.A.I. Gulbarga, Karnataka. Bairu has also worked as free lance artist and contributed illustrations and cover page paintings in weekly and monthly magazines and various educational books. 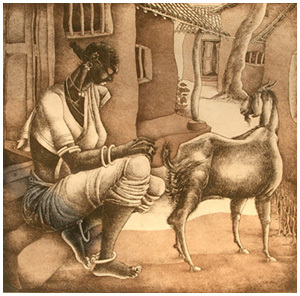 Bairu Raghuram has received many awards including the Bharat Kala Parishad (1981 & 1985), the Gold medal from Hyderabad Art Society (1983,1987 & 1996) and the National Academi Award (1997). He has participated in numerous Group shows & One Man shows. Amongst others, his collections are included in The Ideal Fine Art Institute Gulbarga, Karnataka; Lalith Kala Akademi, New Delhi; Victoria Capital Ventares Ltd, Mumbai; Hallburton Oilfield Services India Ltd, Bombay;Alliance Francaise, Hyderabad; Bharat Bhavan,Bhopal other private collections in India, UK, USA, France, Switzerland, Germany and Canada.